Injury prevention is critical during training. Good shoes, good running form, good stretching, and adequate recovery after workouts will help to minimize the risk of injury. Common running injuries are described below. Should you experience these symptoms of injury, treat them immediately. If you have to skip a run or two, that is okay. You can still finish the marathon or half marathon. However, if you ignore the symptoms, you could find yourself in trouble and never even reach the starting line on your big day. Injury prevention will be a very important part of your training. Symptoms: Pain in the shins. Typically during runs and/or early in the morning. The pain may be dull at first and gradually increase during runs or throughout training. The pain is commonly caused by the detachment of the muscle to the bone. Stress fractures can result if not treated. Treatment: Ice and rest. Take a day off and skip a run or two if you need to. Ice both shins for 15-20 minutes four times per day. Ibuprofen will also help. Symptoms: Pain around the kneecap. Pain is generally felt under the kneecap. It may begin as a dull pain that occurs during a run. The pain may become sharp as you run or it may simply go away. The pain is often felt when running downhill. Treatment: Take time off from running. Consider skipping a run or two. Ice four times a day for 15-20 minutes each time. Make sure you are stretching properly and maybe add more stretching to your training. Instead of stretching once, stretch twice. Avoid downhill running. Symptoms: Pain in the foot between the heel and toes. Your foot may feel very tender when you begin a run or step out of bed in the morning. Treatment: Take a day off and skip a run or two if you need to. 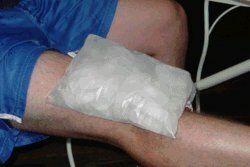 Ice the area for 15-20 minutes four times per day. Take ibuprofen. Further stretch the calf muscles. If you begin to experience any of these pains, then treat them immediately. If pain persists after treating for 2-3 weeks, then consider seeing your doctor. Injury prevention is critical to your success. Injury prevention is best done by awareness, ice, and rest. Extra stretching after runs or lifting weights can also help. The Runner's World Guide to Injury Prevention: How to Identify Problems, Speed Healing, and Run Pain-Free is a great resource on injury prevention.